What is the Largest Raindrop Possible? Harry K. asks: Why are raindrops always so small. 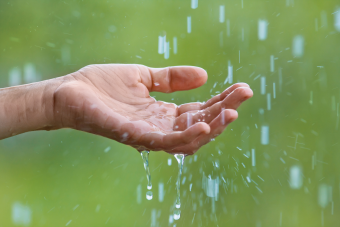 Would it be possible to have a single raindrop that contains gallons of water? At only about half as wide in diameter as a U.S. penny, the largest raindrops ever recorded, between 8.8 mm and 1 cm, were observed by scientists in the clouds above Brazil (1995) and the Marshall Islands (1999). It is unknown, however, if these bad boys ever reached the ground at that size. So why can’t raindrops grow to arbitrarily large sizes? To begin with, let’s talk a little about how raindrops actually form. Raindrops are more than just water; the vapor in a cloud has to have something to condense around, without which there would be no rain. Called condensation nuclei, little particles in the air, from dust, smoke or even salt, sit at the center of the tiny droplets that begin to form in a cloud. These tiny droplets, usually between 0.001 and 0.005 mm in diameter, at first form a nearly spherical shape thanks to the relatively strong cohesive forces between the water molecules. As the water drop is buffeted around in the air, it collides with other drops, and these small drops coalesce into larger and larger droplets. Ultimately the water drop will become large enough to fall to earth. When this happens, the surface tension of the water that keeps the drop more or less spherical is partially overcome by the airflow pressure on its lower surface as it falls. This causes the bottom of the drop to flatten out, while the top retains its rounded shape. Thus, contrary to the popular perception of a teardrop shaped raindrop, thanks to the various pressures the water drop is subjected to as it falls to the ground, the raindrop actually tends to look sort of like a kidney bean or the top of a hamburger bun. For very large droplets, it can even start to look something like a jellyfish bell, with this usually happening when a raindrop reaches around 4 mm across. When the droplets get larger than this (at around 5 mm), the air pressure will ultimately overcome the surface tension of the water completely and the raindrop will split apart. As the drop continues to fall, it can continue to grow or shrink as it bumps into and absorbs or is broken apart by other droplets. Thanks to this process, the average raindrop that actually makes it to your head is only around 1 to 2 mm across. Even factoring in that these large drops were buffeting about in the clouds instead of falling to earth, the scientists were surprised to find that they could last long enough to grow that big without being broken apart; rather, during that early research in Hawaii, they found that the average lifespan of a 5 mm drop was around a remarkable 20 minutes. For the aforementioned 8.8 mm and 1 cm record-holding raindrops found in the clouds over Brazil, scientists opined that they were the product of relatively large ash particles from fires burning in one of Brazil’s rainforests- the larger the condensation nuclei, the larger the raindrop can potentially be, at least to a point. As for the similarly sized raindrops observed in 1999 on a relatively clear day in the Marshall Islands, they hypothesized that these droplets formed around salt nuclei and that there must have been an unusually high content of liquid water in a narrow area of clouds which caused the droplets to collide more frequently, but without breaking, forming these mega-drops. Cherrapunji, India holds two of the top rainfall records. On June 15-16, 1995, it endured 98.15 inches of rain, the most in any 48-hour period. And, from August 1860-July 1861, it received the most rain in any one year: 86 feet, 10 inches! All of this rain comes from the monsoons that visit south Asia each year. As moist air rises from the Indian Ocean up across Bangladesh and India, it eventually collides with the Himalayas and ultimately drops it in torrential rainfall. Unionville, Maryland holds the record for the most rain in one minute – at 1.22 inches on July 4, 1956. The record for most rain in 24 hours is held by Foc-Foc, La Réunion, which received 71.8 inches on January 7-8, 1966. While people often exaggerate tiny hailstones as “golf-ball size” when describing them to others, in June of 2003 Aurora, Nebraska experienced one hail of a hailstorm. The National Climate Extremes Committee documented the hail size that fell in that storm, with many being about the size of a soft ball. One particular hailstone found from that storm is the largest ever (by size) well documented- a full seven inches in diameter, or just a little smaller than a standard soccer ball. As for the largest ever hailstone by weight, the record stone fell in Gopalganj, Bangladesh, on April 14, 1986 and weighed 2.25 pounds or 1.02 kg. The process described above is the collision-coalescence process, which mainly occurs in tropical areas. For cooler climates, there is another process called the Bergeron Process, where instead the water forms ice crystals in the cloud. Once the ice crystals are large enough, they will fall, but then hit the warmer air below, thus melting into rain.